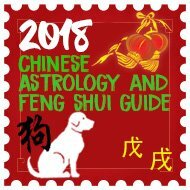 From 5th January 2018 to 3rd February 2018 is the twelth month Gui Chou (Yin Water Ox) of the Ding You year (Yin Fire Rooster year) with the ruling energy of #6 in the central grid. Kun 2 Black (Ju Men) is an earth star and a yin Trigram. It affects the stomach, digestive, general sickness and problems with thought process. It also affects the Matriarch (eldest female) and overall very inauspicious and needs either cures or avoidance this month in this area otherwise it can cause many problems. If your bedroom, office, lounge, main door or other important room is located in this area this month and you are unable to move out please read this section carefully. The good news is you now know this is an inauspicious star and you can do much to dissipate its negative influences for the month, so do not panic at all. The good news is that the annual #6 stars metal influence will weaken the effects of the #2 visiting monthly star. Try and keep this area of your building as quiet as possible and avoid building work or renovations this month. If this part of your building is a bathroom, utility room, guest bedroom or other less important room do not panic, this is great news for you and no cures are needed this month. The 2 Black in Period 8 is an untimely star and hence its influence will be of a negative nature. You must place a Wu Lou and six Chinese coins tied with red ribbon, metal singing bowl and also place more round metal decorative objects (provided they are not menacing looking, round shape metal is good) to dissipate its negative influence in this part of your home or room. Avoid triangular or sharp shapes in this area. Ladies expecting should try and avoid using a bedroom if it is located in this area. If there is no choice implement the necessary cures. Place a brass Wu-Lou beside your bed. The brass Wu-Lou (also known as a calabash) gives elemental support to this area this month and also symbolises good health and dissipates the negative energy of the #2 star. More importantly, do not decorate this room with red fire colours or triangle shapes items and most important avoid burning candles or leaving bright fiery coloured lights on for too long during the month. The most important cures to place in this area are a set of six Chinese coins tied with red ribbon. Once disturbed, this affliction will bring about three types of misfortunes financial loss, sickness and arguments. – Hang six Chinese coins tied in red ribbon. – You can use any metal ornament as long as it is not sharp or aggressive looking, and believe it or not a good cure is a round metal dog bowl or weight lifters weights. – A brass wealth ingot is good for protecting wealth. – Place a Wu Lou and/or other metal ornaments to dissipate the negative earth. – A metal singing bowl is very good as is a stainless-steel Dog bowl. – Naturally not as powerful but round metal shapes are an alternative to using Feng Shui items but avoid sharp or menacing looking metal objects. Li 9 Purple (You Bi) Li 9 Purple is a fire star and a yin trigram and considered a star of future wealth and has an auspicious influence in Period 8. Career opportunities and promotions are probable especially if you have an office or main door in this area this month. This is a good area in general especially for those in studies. If this is a family area (living, dining or a library), encourage children to study here. Couples with a bedroom in this location can also enjoy good relationships. There may also be a chance of producing intelligent children. If you want to enhance this further place a statue of Kwan Yin in this part of your bedroom. – Healthy green leafy plants or blue flowering plants such as violets are good for this area. – Fresh flowers displayed here will bring positive qi too. – Symbolic objects such as a wu lou or six Chinese coins can be placed here all month round to enhance benevolent influence and at the same time dissipate the malevolent influence by the visiting monthly #2 and #5. Sun 4 green Wen Qu romance and literacy star is a wood star. It affects the thighs, hip, buttock, bladder, liver and can cause colds and flu although on the whole it is considered an auspicious star. The Sun wood 4 is a conditional star and is auspicious in Period 8 (2004 – 2024). It governs romance, career, travel, creative, academic and artistic talents, wisdom and intelligence as well as self-development. With the wood of the #4 star flying in for the month, we can expect a lovely energy from here as it creates a lovely peach blossom if activated correctly with the right enhancers. Please remember that the Three Killings are located here along with Sui Po so it would not be wise to make a lot of noise in the east this month. Whilst this star is very auspicious if you have any poison arrows like lamp posts, pylons or large corners of house’s pointing toward this area consider hanging a ba gua wealth protection mirror outside pointing toward the offending object as the #4 star can bring both wanted and unwanted romantic opportunities to the household if the cures are not put in place. Having a door in this area can bring in new opportunities and lots of travel and perfect for a company that deals with travel or printing. Do not use fire or metal in this area or colours white, silver this month. Do not worry if you have these colours already for the annual #8 star, just introduce colours blue or black in the way of a floor mat, cushions, tablecloth or similar. Couples with a bedroom in this location can also enjoy good relationships. There may also be a chance of producing intelligent children. If you want to enhance this further place a statue of Kwan Yin in this area of your bedroom. – Use blue in your décor if this is your office or bedroom. – Avoid displaying metal objects here especially large heavy ornaments. – Fresh flowers or small pots of green leafy or flowering plants can be displayed in this spot of the house to lift the qi. Blue or green flowers are a good choice. – If you have mandarin ducks this is a good area to have them and any other symbols of romance like hugging couples etc. The 5 Yellow (Lian Zhen) star of tragedy is located in the southeast this month. It affects the overall luck, virtually all types of illness including many mind related problems with regards to thought process, lack of energy and procrastination. It will not affect anyone in particular in the home as the #5 star does not have a trigram and no yin or yang energy so to speak and this is why the negative aspects of this star are so strong. Overall a very inauspicious star and needs either cures or avoidance this month in this area otherwise it can cause many problems. If your bedroom, office, lounge, main door or other important room is located in this area and you are unable to move out please read this section carefully. The good news is you now know this is an inauspicious star and you can do much to dissipate its negative influences or the month so do not panic at all. When disturbed, its malicious influence brings tragedy, sickness, lawsuits and major loss of wealth. Do be careful with it. Stillness together with metal cures can keep its negative influences at bay and you must avoid using fire energy like reds and candles in this area this month. You should place a Wu Lou and six Chinese coins tied with red ribbon and also place more metal decorative objects (provided they are not menacing looking, round shape metal is good) to dissipate its negative influence. You MUST NEVER disturb this area inside or out with lots of drilling or knocking activities. So please be careful if you have work to do and if you have a main door here you should also place a flat Ba Gua wealth protection mirror. You must not place red objects, bright lights, candles or red coloured furnishing this month. Do not worry if you have these colours already just introduce colours white, silver, gold or copper in the way of a floor mat, cushions, throws, tablecloth or such like. You can also use dark blue or black if you prefer. If your bathroom, cloakroom, en-suite, guest room or a large cupboard is located here, this is good for you, because these areas are not used much and therefore the negative power is not activated. – Avoid playing loud music in this area of the home or room. – Do not decorate your room with red or earth colours this month. Grey, blue or white beddings and curtains are good colours to use temporarily. – Place a Brass Wu-Lou in this corner of the room if this is your bedroom. – Metal objects such as six Chinese metal coins tied in a red ribbon and/or a brass Dragon can be placed in this corner too. Do not to use red dragons. – Do not place red objects, burning candles or triangular shaped furnishing in this sector. – A Pi Yao in a gold colour is very effective at not only reducing the bad earth but by also protecting your wealth for the month in this area. Kan 1 White Kan (Tang Lang) is a water element and a yang Trigram. In the physical body it is the ear. Internal organ it is the kidneys and it is also blood. It also affects wealth career and luck and because it is timely in period 8 (2004 – 2024) it is considered an auspicious flying star. This area can also be very good for relationships this month and to enhance you should introduce some metal elements that are round in shape, a traditional enhancer and cure is a brass wu lou or any object that is round in shape and made from a good quality metal like brass copper, steel. As we have the annual #5 in place, you should already have water metal cures in place to weaken the negative effects; try to introduce more metal colours this month to enhance the monthly star. If you activate this area of the home this month it can bring in new opportunities, gains in financial investments, academic achievements and also romance and relationships as peach blossom is very good here. If this area is a bedroom, office, study lounge or other important room you should place a wu lou or other round metal objects which is auspicious. It is also very good to hang a set of six Chinese i-ching coins tied with red ribbon. This is a very traditional and authentic enhancer for the #1 flying star. Blues, black, grey or charcoal would be a good colour scheme for this room. You can introduce these colours in beddings, throws, lampshades, pillow covers etc. If you have a bed located in this area, remember to place a brass wu-lou beside the bed. Avoid fire colours like red, pink, purple, orange, lilac etc in this area and also avoid candles at all costs. – A brass Wu-Lou is advisable for a bedroom that falls into this area along with all shades of blue, black, grey or charcoal colours. This is especially so if you are not in good health and if you cannot buy a wu lou place a heavy round object close to your bed but avoid candles or colours red, pink, orange, purple or any fire colours. – Place a set of six auspicious i-ching Chinese coins tied with red ribbon in a certain order (Xing Yun Qang) this is so important if you have a middle son sleeping or spending a lot of time in this area this month. – Avoid candles or fire colours like red, pink, purple, orange or burgundy in this area. This is a lovely influence for the month and if you follow all this advice here your month will be just fine. Chen 3 Jade (Lu Cun Xing) is a wood star and a yang Trigram. It affects the feet, lungs, convulsions, liver, bladder, limbs and hysteria. It also affects the eldest son and overall very inauspicious and needs cures or avoidance this month in this area otherwise it can cause many problems. You must be aware of possible theft, arguments, disputes, hot tempers, loss of wealth and legal problems especially if you have a main door or important room in this area this month. You should not use red colours or fire cures this month as this will aggravate the #7 annual star. Instead, you should introduce more water colours to weaken the influence of the annual #7 metal star as we will have water weakening the metal which will be destroying the wood although if the metal is being weakened, this will not aggravate the monthly star. If you have a main door or an important room like office, lounge or study ensure that documents signed during the month are checked through thoroughly before committing. The influence of a Chen 3 in Period 8 denotes possible arguments, disagreement, back stabbing and in extreme cases, this can result in lawsuits, either as a petitioner or a defendant and also causes loss of wealth. Either case there will be a loss of time, energy and wealth, so please be careful during this month especially if you have a main door in this area and if you can, try and use another door to enter and leave. You should also hang a Ba Gua mirror with a Chinese i-ching coin on the rear for added protection this month. Do not undertake any form of noisy renovations or re-decorative work in this part of your house or office this month. Nor should you disturb the ground by digging, building foundations or conduct any maintenance work with any noisy equipment in this area inside or outside your property or garden this month. – Do not hang wind chimes of any material in this area this month, especially metal wind chimes as it will worsen matters. – During hot summer months, make sure the fan is not located in this area this month. – Try and keep this area quiet and do not disturb with loud noises. – Try not to let children or noisy animals play in this area. – Most important is not to disturb the ground inside or out. Ken 8 White Zuo Fu is an earth star and a yang Trigram and is the most auspicious governing flying star of the lower era of the sexagenarian cycle of the flying stars (Xuan Kong) system. Wealth, fame, romance, prestige and distinction can be expected especially if you have an office here, even if you do not you can still activate it. When activated correctly it brings good fortune and exciting times even with the conflict of elements. If you work with symbols, quartz crystals, crystal balls or hanging faceted crystals are very good for this area this month. The #8 star also governs relationships so a nice romance enhancer is a pair of Mandarin Ducks. Please remember that Tai Sui is located here and low noise is key to avoiding problems this month. Whilst wealth is forecast this month for this area, beware of overworking as this can cause health problems if you have a bedroom or office here. The additional work will bring a good income but be careful of your health; in particular stress related resulting in high blood pressure or kidney problems. Do not place heavy metal in this area of your home or office this month, as it will weaken the good earth. – Hang a faceted crystal sphere in this area. Hang it above head height and twist now and again. – The energies of the monthly 8 can be activated by human activities. Use this room as frequently as possible unless you have received professional advice against it. – A red three-legged toad can be placed here. Make sure the toad is facing into the house and not towards the door and the coin is never taken out of his mouth. – Introduce some fire colours into this area to balance the energies, a quick and easy way is using bed covers, rugs, table covers, sofa throws etc. – A romance enhancer is a pair of Mandarin Ducks in this area this month. Tui 7 Red (Po Jun) robbery star is a metal star and a yin trigram and known as the mischievous Po Jun #7 argumentative red star is a negative influence in Period 8. The trigram Tui is also known as ’Broken Soldier’. This is a fighting star which can cause problems if left alone, the #7 Red indicates a high risk of burglary, deception, copyright theft, gossip and back stabbing this month. This area is not good for writers, artist or children studying and especially so for the youngest daughter although cures can be placed to dissipate the negative influence this month so do not worry. If you have a door that is used often in this area or even a window you should be looking to update security, smoke alarms and checking electrics. Please take this advice seriously as I have been doing this a long time and I know when this combination meets it can cause many problems this month. Sorry to harp on but please take extra security measures especially if you have a front, back or side door in this sector. Make sure doors and windows are fastened securely before leaving the house. Do not display valuable items on windowsills, which may attract the interests of passers-by. Good colours are blue or black. Avoid earth and fire colours and quartz crystals. If you have an office or door in this area be careful of people trying to deceive you, robbery, arguments and loss of wealth, always look at the very small print and be careful as this star normally causes problems with people you know and thought you could trust. – You should also use more blue, grey, black or charcoal colours in your decoration. You can introduce the colour with cushions, rugs, bed covers or doormats. – Do not use anything of fire element or colours red to control it as this may aggravate it. – Avoid candles in this area at all costs. – Install or service/upgrade smoke alarms and security systems. Ch’ien 6 White The star of Heaven star (Wu Qu) is a compassionate money star and a yang Trigram and it affects the lungs, large intestines and head and can impact the Patriarch (eldest male) although on the whole it is considered an auspicious star. Those who have main doors or offices in this area may enjoy excellent business and career success. 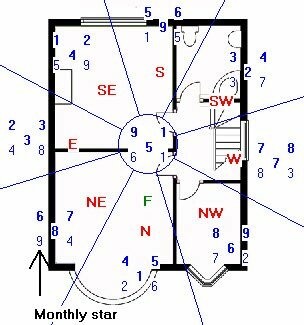 However, whilst 6 White represents accomplishment, if the #6 monthly star is located in a bedroom it can cause problems with the throat, and/or legs and also problems with breathing especially for the eldest male although they are minor problem and nothing to worry about if you follow the advice here. If you do have a bedroom in this area place some blue, black, grey or charcoal cloth such as a rug or duvet covers to dissipate its energy. – If this is your bedroom, a shade of blue or black in your furnishing or décor may help with health. A blue painting (not water scene) may also do. – Place a set of six coins in a row in this area; these are very traditional and powerful cures. – Real quartz crystal is very good in this area for the month as are faceted crystal spheres. 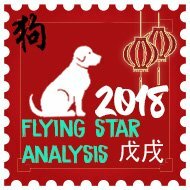 If you would like to be informed in advance of the monthly, annual and fixed flying stars for the rest of your life, maybe consider our advanced flying star software, it is used by Feng Shui Masters, Practitioners and students throughout the world. To further enhance your month check out the January monthly almanac as it not only gives you good and bad days to do certain tasks it also tells you if it is good for your animal sign. 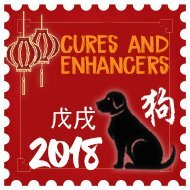 Visit the pages below for further details on 2018 Chinese New Year etc. I know it can seem very disheartening but the Flying Stars do not change for the year until the 4th February and you should look at this as a new start to the year. I would really recommend reading through the article and make notes and what to put in each area so that you can break it down in to easy to read parts. There are a lot of free suggestions in this article such as colours and shapes that are easy to implement. 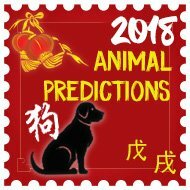 I hope this helps you make some positive changes in the year of the Dog, Carla. Sorry about the mix-up. The above all applies to the January Flying stars and it is just the sentence that mentions October which is outdated.